Wow what a service! The watch is just about ideal for my needs and combined with the service from Goldsmiths who fitted the watch strap for me, removing a number of links, I cant fault anything about Watch Shop. With the radio reception on the watch it means that there will be yet one less thing to alter 2ce a year. The only things I could say that might be better about the watch would be that the date could be larger and do we really need to know what year it is every day when you read the face? I have the same watch that I have had for some time and the watch has worn down to the plastic so I have ordered the same watch again. I have been impressed with the cost of the watch as being a second watch with the discount also the quick postage of the watches. Just about the only radio-controlled digital display watch available - which is what I wanted. Nice, clear display with all the features I could ask for - and, of course, an excellent timekeeper. The last one I had, part of the casing that secures the strap in position broke after several years use, so I am hoping for better this time. Fantastic watch, bought for my wife as she likes a large unit, had to remove some links to fit her wrist but that was easily done. No need to worry about time-keeping and logs on every night from a shelf in the bedroom. Found that if it is placed next to the radio alarm it prevents logging on but this is covered in the instructions. Excellent watch, better than previous of this edition. So far so good! No factory reset so far! I am delighted with my new watch - I buy one only once every ten years so I think that the Casio has all the potential to provide the features that I need and to stay the distance. Only one slight negative - the strap was not resized as requested and I had to get a local jeweler to do this for me. All is now well and I am thoroughly enjoying my versatile new time-piece, which I would recommend without hesitation and even as a not very techno 70 year old I found the features easy to access and adjust. Believe it or not this is my second watch of exactly the same type! I find it an excellent time piece with all the necessary information to hand excuse the pun. My current Casio Wave Ceptor is getting a bit worn and the face is scratched a little my fault for wearing it all the time come what may. I find the accuracy of the time piece excellent and have used the World Time selection a few times when I have gone on holiday. The Timer works well and likewise the Stopwatch. Anyone who buys this watch will need to read the instructions to ensure they get the button sequence correct for selecting the various functions. I liked the look of this watch and the price was perfect. I liked the look of the strap and it now feels very nice on my wrist, not heavy or bulky. I chose the option to take it to my local Goldsmiths to have some links removed. They were very polite and when finished, it fits like a glove. I would highly recommend Watch Shop if you want a good watch and good service. This is the second one of this Casio Wave Ceptor watches I have purchased. The first one latest me for approx. 4years. They are great watches, easy to see the Time, date, year etc. and also has many other features. The best thing I like about this watch is that you never need to adjust the time yourself as it is Radio Controlled and picks up a signal and adjusts the time accordingly by its self, great for when the clocks go forward or backwards, or in a different country etc. I highly recommend this watch & for the money, is very good value and a nice lightweight, good looking watch. Casio watch. Love it! Does what it says on the tin and looks good too. What more do you want?! Got this one last December 2015, great multi function watch easy to set up and use, a bargain at only £30. Goldsmiths adjusted the strap at no extra cost and even gave me a coffee while I waited. 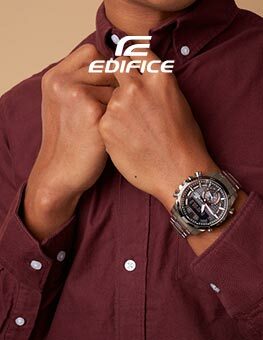 Based on the quality of this watch and the 1st class service from the Watch Shop group, I have just ordered an expensive Edefice WaveCeptor from the Watch Shop. I would not hesitate to recommend this product or company to my friends and family. Having seen this watch on various websites, I asked my wife to buy me one for my upcoming birthday. I particularly liked the display format showing the time/day/date all in one,and the accuracy provided by radio control. I did not see the information regarding the watch strap until after I had placed the order, but, referring to a very good you-tube video, I was able to remove the 3 links required in 5 minutes using a bradawl and a pair of pliers. Adjustment of the watch was fairly straightforward, once I realised that nearly all these are obtained from the time screen - the one with the day of the week in the bottom left. It may be advisable to send the watch out with this screen on display, so that this may be more clear. The watch is a bit fatter than those I an used to, but this is possibly understandable given the number of facilities available. Battery replacement should, hopefully, be also straightforward, as the back is easily removed using a small Philips screwdriver on the 4 screws holding it. A possible drawback with the watch is the volume of the alarm, since this, I think, would only awaken the lightest of sleepers. Some reviews mention that the watch becomes a bit tatty in appearance after a while, but my first impression was most favourable. I suppose, time will tell. As far as I can see, a very good watch at a very reasonable price. Looks really good and does exactly what I want. I particularly chose it because of the radio time signal, as I often need accurate timekeeping aligned to the Rugby time signal. It is exceptional value for a watch with that feature. It is far too early to say what its long term reliability will be like. Nor is it possible to judge if the plastic case with metallic finish will last. However, the metal strap is great plus as Find the rubber straps wear out very quickly and, on cheaper watches at any rate, it is not possible to replace them. Excellent all round value giving a totally accurate and reliable time via the radio controlled function, coupled with alarm, stopwatch, world time and water resistant to 50m. It does everything you could want from an everyday watch and allows me to leave my relatively expensive dress watch for special occasions - which ironically is less accurate. I have had this watch before and it is excellent. The 2 main features that attracted me are the accuracy of the time and also having the ability to configure the date and month in English format ie day before the month as opposed to the American where the mont is before the day date. I wanted an easy to read digital face and this watch is perfect on that score. I like the fact that it uses a time signal and doesnt need to be adjusted. The bracelet feels sturdy and is comfortable to wear. I took advantage of the bracelet sizing service - excellent. I am extremely pleased with my Casio WV-58DU-1AVES watch. A very good watch and very good service. The click and collect system worked very well with excellent service from Goldsmiths. I like the functionality of this watch radio update in the early hours, alarm, stopwatch, timer, world time. In fact I bought this to replace one of exactly the same type. BUT - as mentioned in some other reviews, it is let down by the case. It is a resin case with matte silver paint - which wears off to expose a light gray plastic that looks tatty. There is a stainless steel insert but that covers only around half the surface and it doesnt cover the parts of the case that the most proud and wear most quickly. I am pleased to see that WatchShop at least mention resin in the description of the case - a good number of other retailers claim it is stainless steel which it most certainly is not! Worse still, the plastic case has weak points where the strap attaches, and the most likely way for this watch to fail is for the resin to break around the watch-spring so the strap becomes detached. Having said that, my last watch did last a good number of years enough to look very tatty. Also as mentioned elsewhere, you can get some odd behaviour when the battery is running low usually a reset when you try to do something - then you have to set the timezone manually so it knows what frequency to listen on to put itself right again. But battery replacement is easy - four cross-head screws and a pin or such-like to release the spring cage. Battery type CR1620. They do last a good while Id say at least a couple of years. I would pay five times the price for this watch if it had a decent stainless steel case. being radio controlled it keeps excellent time. The watch fits to the wrist really well and looks good. Its a Casio watch - not quite from the cheapest part of their range. For the under £30 price seems to be a good buy. The Wave Ceptor has everything that any watch could offer. \r\n\r\nThe black plastic model has a belt-type strap. My silver model, though very smart, required professional adjustment of the strap which cost me £10. This is the second time weve ordered this same watch. Its worn by my father in law who works with his hands day in day out, but its durable, strong, looks good and is functional and easy to use - so much so that after a good deal of time having the same watch he doesnt want a different one! The price certainly makes this watch excellent value from a trusted manufacturer. This watch is better than i thought, very clear display and easy to use ! This is the second watch of this type that ive had. the only drawback I found was that it is not all stainless steel, some is plastic and when it ages it shows. but the watch itself I can not fault, it does all I want in a watch and at a very good price. Very clear display, easy to use, good price and a very good name ! Watch received within 48 hours of ordering. Popped into my local Goldsmiths to have the braclet adjusted, wonderful. Casio Wave Ceptor, watch has all the facilities I required and was adjusted to the correct size for my wrist. The watch has multiple functions and the bracelet is a comfortable fit. I required a new, inexpensive watch, one that was easy to adjust when holidaying abroad, and this one seemed to be appropriate. Not only is it simple to alter to a new time zone, but it does this swiftly as well. Additionally, it is easy to read the time, date and, for a retired guy, the day of the week, and the night light is easy to operate and stays on for several seconds, making it easy to see the time even if it is pitch black. It has an alarm setting and, if required, an hourly audio signal, as well as settings for stop-watch and for counting down. All in all, with free and speedy delivery, I would state that this watch is good value for money. Wanted a watch for work/going out. This watch fits both perfectly. Great product. Great price. Great service. Nuff sed! My review must be in two halves the service and the online process. I first attempted to purchase a Mens Casio Wave Ceptor Alarm Chronograph Radio Controlled Watch WV-58DU-1AVES on the Watch Hut/Shop website. It was easy enough to find the watch I wanted but when I went through the process of purchasing it things began to go wrong. Having entered all my payment details I pressed the submit button only to be faced with a screen message saying that something had gone wrong. I didnt know whether the order had gone through or not. Nor did I know if the payment had been taken. If I was to go through the process again, how could I be sure that a second amount would be taken from my bank. Therefore, I telephoned the number given on the webpage and spoke to a young woman who said she would check to see if they had received my order. She said that no order had been received and that it would be safe for me to re-order. However, as I was already on the phone I asked if she could process it for me. This she was happy to do and we completed the process . She gave me my order number and this was then confirmed by email. The cost of the watch was subsequently taken from my bank account and the next day I took delivery of my watch. Perfect. The following day I discovered that a second deduction had been made from my bank. One deduction had been made by WatchShop and one by WatchHut. I telephoned again. This time I spoke to a different adviser and explained what had happened. He was very apologetic and said he would look into what had happened, but, unfortunately, as it was a Saturday, he was working from home and wouldnt be able speak to his manager until the Monday. He promised that he would contact me after he had done this. Fair enough. On the Monday, as I waited for him to get back to me, a second watch was delivered. I now made my third phone call and was told how I would need to go about sending the watch back. The happy end of the matter was that the money for the second watch was paid back into my account. So, extremely happy with the watch but not with the initial process, and confused by the use of the two names WatchHut and WatchShop. Nice watch.exactly as description on website.always the exact time.only down side is resin case which ultimately loses colour and can break away from bracelet if you snag it. Nice clear face , easy to read. Metal bracelet is easily adjustable. Back light is not too bright but just right. This watch is just what it is supposed to be - the Watch Shop service and low prices are what makes the difference! I absolutely love this watch. Following the instructions this watch is very easy to set up, and gives you the correct time as per the speaking clock. The watch also gives you the date, year, day, also on the facia, making this a must buy for not a lot of money. Excellent product at the right price received in good time. Would use the watch shop again. The watch does everything I expected and with the Radio time connection it is accurate to the second. The world time facility is very useful. I bought this watch for my husband and he is very pleased with it. Every feature about it is very clear. Its lovely to have the day and date featured as well as the perfect timing. Just the job. This is my second one of this model since the first got damaged. Early days yet but the watch is all one would expect from the description. Without reference to u tube I would not have managed to adjust the strap myself. I just got this from watch shop. com and it is a very good watch for the price. Cheaper than any other shops u can visit in person. Went there saw it cheaper on watch shop and ordered it there instead. I will definitely order my next watch from watch shop next time. Excellent purchase for my Wife who as Alzheimers, she now knows the day ,time and date. Thank you. A great watch easy to adjust the bracelet and being solar powered and radio controlled makes it great value for money. I owned the previous model of this watch, which I was very happy with and so when the old one finally stopped working I decided to buy the newer version of this watch. I think the best feature of the watch is the fact that it is accurate to the second. It also has all the standard features you would expect from a watch of this type timer, stop watch, alarm etc. The only drawback with this watch is quite difficult to adjuust the braclet size. Other Casio watches are easy to adjust the braclet, but with this one you need a jewelers screwdriver i.e. a very small screwdriver to adjust it to the size of your wrist. You also need to go Youtube to learn how to actually adjust the braclet, as it appears to be the only place to show how to do it. Or just take it to a watch repair shop and pay for them to do it. Fantastic had an digital and analogue casio for five years, thought I would update to wave ceptor. So no altering when clocks go back and forth. Makes life easier. Excellent. This watch I going to be very useful to me. Day/date and perpetual calendar. Just what I wanted. 10 year battery wonderful. Reasonable price. The watch is superb for the price and I agree with the positive reviews already made. An excellent watch with all the features on could wish for and always correct due to radio control, the price is very competitive as well. Service and delivery were efficient too. I have owned one of these watches for many years and this is a replacement as I like the watch so much. this watch meets all my requirements to a T, know need to worry about d.s.t. settings,and of cause keeps accurate timekeeping. Casio s are excellent watches. I have got more of them and they are very reliable, long lasting and I have had no problems from them yet and I do not expect any. The best thing about Casio watches is that the manufacturer is a forward looking one in that they always keep up to date with the current technology and sometimes they are proactive in their designs. Im a regular buyer of Casio watches, which are well made and are reliable. My purchase replaced a radio-controlled watch that Id had for a number of years but had had a recent alarm buzzer failure. The replacement watch has a resin case with a stainless steel strap. Ive found that the resin/rubber straps tend to tear quickly where the clip engages. The watch is easily set up to receive the local time signal update, which maintains the highly accurate time. My only reservation is that the watch does not come with instructions on how to adjust the strap. However, the instructions can easily be found on YouTube and the links are easy to remove and refit without compromising the integrity of the strap. In summary this is a recommended watch that keeps perfect time. It is reassuring to find that this watch always agrees to the nearest second with my radio-controlled bed-side clock, which has a mains adaptor. The only disagreement occurs on the rare occasions when the watch battery needs replacing. The digital display is easy to read and the control settings never need to be adjusted. One small reservation: the user manual is too small to read, but OK when enlarged up to A4 size. Easy to set up. Good quality strap, functions are easy to use and even kept it on while swimming with no problems at all. Good product for the price. Very nicely made and finished, fantastically accurate, incredible value for only £33.00. Purchased this watch as replacement of the same watch my husband has had for some years and was so disappointed it had stopped working. He loves it as its time is absolutely spot on and so easy to reset with the seasons. He has not received it from me yet as it is his Golden Wedding Anniversary gift from me. The order was dealt with efficiently, delivered without delay. I am very pleased with the product, and thank you for your attention to me request. Because the watch is able to receive time signals from the remote transmmitter it is always accurate and although they recommend that it be left on a windowsill over night, I sleep with mine on and it always picks up the signal. As well as accurate time it has a number of other features. Stop watch, foreign time, built-in light etc The watch wv-58DU-1AVES cost £33 which I consider to be excellent value for money. On the plus side, the watch looks very good it is great to know that the time is always correct and when going abroad it is trivial to change it to a new time zone. On the minus side, the alarm is so quiet as to be essentially useless. 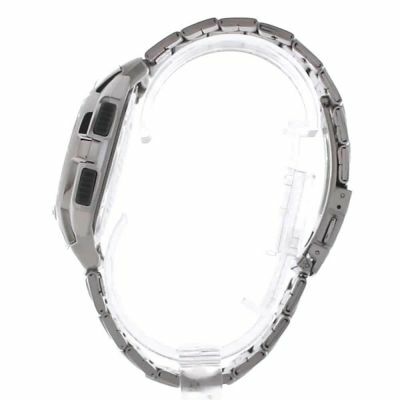 In addition, the part of the watch body that connects to the strap is made of plastic. Mine broke after a couple of years, for no good reason. And the watch goes a bit crazy when the battery is running low. Excellent fast service, would highly recommend. This item is terrific, it does everything it said it would and I am delighted with it. Watch Shop service was excellent throughout, even refunding me half the cost of getting the metal strap shortened by two links by a local jeweller . I was also impressed by the speed of delivery and the very professional website ordering system and confirmation invoice and admin paperwork. Well done to all concerned. Ordered the watch, had difficulty in choosing as there were so many to choose from. delivery was quoted for 5 working days watch was delivered in 3. so far the watch has worked well, time is the only real test its durability as I as very heavy handed on watches but so far so good. This watch was bought for our son who has learning difficulties to teach him how to tell the time and it worked. He now calls it his magic watch and he wears it with pride and it is well worth the price paid. When the clocks go forward, or backward, we smile, why? Wave captor does it for us. No matter where you are. A watch that fits, the small or the big wrist. Stunning silver, digitally expressed. The day, the month, the year, the time. It does what its meant to do. Stopwatch, timer, alarm and hour chime. It also shed light on the time. Bought as a gift for my partner, he loves it! Good watch for the price, bought it for wearing to work, like the fact that i can clearly see the time, date and day all at the same time with out having to press buttons, also like that you can change the date format from month day to day month and the way it gets a time signal each night so the time is always accurate. Order was delivered before the expected date. Very prompt service. Will definitely shop here again. An excellent purchase. A very reasonably priced watch which does all it promises. Looks good on the wrist and has all the features I wanted. Very nice watch, good quality and strong so will last for years. Digits easy to read at a glance. Smart and sensible watch. Ultra accurate and comes with world times, alarm, hourly chime, stopwatch and countdown time. Looks great on with a suit of casual clothing. EVERYONE should have on one of these. What can I say, The most accurate watch in the world, better than Rol.x! Fab wrist band. Last one only died because I drowned it after not putting the seal on properly! This watch does all I require of a watch date, time DST, light and ease of setting up. I bought this watch because it is radio controlled, has a very clear face, shows day of the week, day, month and year and has other excellent features. Very good value for money. Delivery was really speedy. I am very pleased with my purchase and would recommend it. Thanks. I have had this watch before and was pleased with it then. What I like more than anything is the accuracy. I also like the amount of information that is given and also the feature of being able to swap the date and month around, a lot of watches cannot do this and only give the day and month in American format. I wanted a watch that told reasonably accurate time and I would not have fiddle with it every month to alter the date, also didnt want to spend a fortune. this looked as if it would fit the bill, It exceeded it. It keeps perfect time through the wave captor system the buttons are responsive and not fiddly and has the best back light I have ever seen. I totally recommend this watch. It is stylish and easy to use, waterproof, radio controlled, alarm, stop watch, and usable in all time zones. I bought this because I had the previous version and knew that with Casio I would get extremely good quality at an affordable price. Bought the product as a gift for my father. The product looks great loads of links for a guy with a large wrist. Very good value for money. Modern design with a range of features including back light, alarm and World clock function. 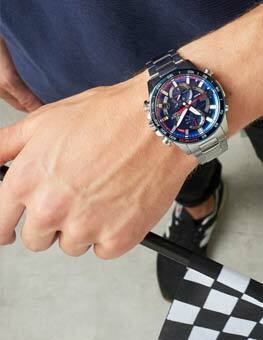 The style was similar to a Casio watch he bought 30 years ago, however I would describe this as more for a younger man / teenager as the watch is quite bulky. Had same 7 years wanted new one for holiday. Paid for next day delivery. Watch arrived couldnt get receiver to show. Travelled to nearest Goldsmiths spent 45 minutes still no one could get receiver. Went to another watch shop selling Casio. They couldnt do it. Goldsmiths returning it and new one ordered via shop so that they can set it hopefully. Should it be this difficult? Maybe an option for you to set before despatching would be useful? It is a good watch as easy to readthe screen, lightweight, very good time-keeping with auto facillity. Countdown timer and stopwatch facility very easy to use. The strap is very comfortable too. Downside is that the handbook is rubbish and it is better to use the Casio website quoting watch type number found on rear case of watch. Usual Casio quality at a very good price. My last watch was a Casio which I wore continuously for the past 15 years. My latest watch is both practical and stylish with a clear digital watch face. The time is easily read but the day and date are not so clear to read. This watch also incorporates the year date which I find is unnecessary, I would have preferred to have larger day and date digits. Lovely looking watch and not to pricey. I was a little worried that it would look big on my small wrist but looks great. Easy to set up and easy yo read. The watch is a Casio Ceptor watch which changes time by itself as it communicates with a satellite or radio. The watch jumped an hour on the first night I wore it and so I sent it back as faulty. The watch was quite light. The product was observed to be the same as what was depicted in the picture. I compared my husbands old watch to this new one and mu husbands watch felt more heavy and sturdy. This one has lasted over 4 years. This watch is a gift for my brother in law. Simple and nice watch, radio controlled, so you dont need to worry about the setting, the ilumination could be better as you cant see the numbers from every angles by night, but otherwise it is a perfect watch for this price. I was very pleaed with the watch, it was just what I wanted. Price was very competitive and goods arrived the next day. Thank you excellent service once again. which has its time synced to a radio signal, so you dont have to think about it being correct. even when the time changes to summer-time, and back, it is automatically changed. The perfect timekeeping tool. I had one of these about 10 years ago and the brand is still as good today. I bought this watch recently, having always bought Casios before, and was pleased as soon as I opened the box. This watch is fantastic value for money, considering all the functions that are available and I always know that the time and date are 100% accurate due to wave captor technology. 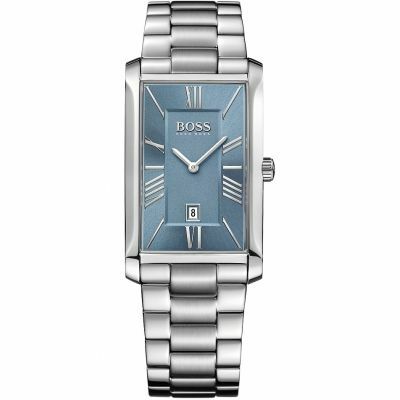 The metal strap and body are in robust stainless steel with a stylish appearance. Why spend hundreds on designer watches when you have total accuracy at an affordable price with this watch. Looks good, easy to use. I like the fact that it changes the time automatically when the clocks change. A good watch,easy to use and read,lightweight,good functions. a very nice watch looks good and feels good to.what else can i say about this watch. Very pleased with my purchase, the watch has got a high quality feel and look about it. No need to ever set time or change it, as it does it automatically for you. In all, great watch, great value! I bought this to replace an identical watch I dropped on a hard floor! I love the way the Wace-Ceptor system works although it did make an error in the change to BST from GMT last weekend! Easily adjusted and now its perfect - always spot on time. I use the previous identical watch in the USA and the system worked perfectly there too - even way up in Maine! stap either to big or to small - but watch great - time change gmt/bst automatic. Very pleased with the speedy service from the Watch Shop and the free bracelet adjustment is a good idea. There is a good vid on youtube to show how to adjust the strap length. I needed to tweak the strap length by moving one of the pins, easy to do and Im a biff! Lovely watch. I bought this watch for my husbands birthday and he loves it. Looks good and it is comfortable to wear. The light up feature is very useful. Not an expensive watch but for the price it is very good quality. Excellent watch. Exactly what I wanted. Delivery within a couple of days. Could not ask for better service. The watch was everything I thought it would be.It is a wave watch so the timing is accurate to the second. It looks good and feels good. i already had the same watch which broke on the shoulder where the strap connects and as its a great , accurate watch ive bought another . really pleased as the watch is extremely accurate ! and wow, very quick delivery as always from you guys . Super fast delivery of radio controlled watch - never loses time and refund of bracelet adjustment money is a superb option. I love this Casio watch it is well built and has solid look and round shape looks brilliant on my arm. It is easy to adjust the bracelet. It is waterproof so can be used when washing etc. It has all the essential information on the dial so no button has to be pressed to get information. It adjusts the time several time of the day automatically so no adjustments are needed. It has alarm and also hourly chime. it has world time so when travelling abroad it gives accurate time in that city. Instructions are easy to follow as these are clear and concise. watch can be used at night time with ease as it has light to show the dial clearly. I will recommend this watch to anyone as a nice basic watch with casio reliability. 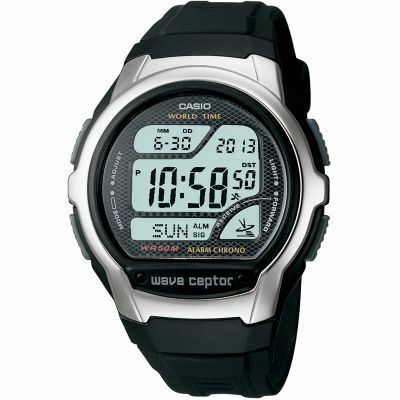 Casio Wave Captor watch is just what I need we for everyday use. I like the large time display , light function, day and date features. Quite easy to set up and what more could you ask for than a Radio time set? I have no negative items to report on this time piece. Great service, also very helpful at goldsmiths in Nottingham when I collected purchase. Ordered on the Monday. On my wrist Wednesday pm. Absolutely no problems, and it fitted its time. Excellent watch, nice and easy to read and setup. Looked stylish on web site, but when it arrived it didnt look as good so I sent it back. This watch is absolutely superb, I cannot fault it in any way easy to sett, it is a great product, everything I wanted, tells me everything that I need to know that the quickest of glances, the alarm and timers are easy to operate everything works really well, in fact I have not taken it off since it arrived the day after I ordered it. First class service first class product. Excellent product - does everything it says and looks smart - very please with the performance of the product. Bought this as a present for my teenage son and he is really pleased with it. He likes the size of it, the weight, the colour and all the functions. Lovely watch exactly what my husband wanted. Instructions were a bit too much. Really smart looking looks good casual as well as dress. Excellent watch, a big chain but walked straight into Goldsmiths and got links removed. I bought this watch to give to my great nephew, the reasoning behind this being with the watch having radio control it would mean that he would not be late for any of his lessons and lectures, and has to now proved to be a purchase well made. Bought this as a present, lovely watch and very big for a males wrist. Wanted a silver smart watch but with a digital face and this watch fitted the description. The Casio watch it is exactly perfect for my husband. It look masculine and manly and it does everything he could possibly want, and it readjusts the time automatically when we change from British Summertime is so easy and the dial is easy to read day or night. Perfect. Very clear display of time, legible without reading glasses! Im very keen to know the exact time, so accuracy to the second is reassuring without radio control any watch can drift badly at end of battery life. I like the longevity of metal compared to resin straps, also the hygeine seems a little easier to maintain. The durability of the metallising could be better, or at least the plastic below could do with a more convincing colour. exellent vallue for money, but more important perfect time keeping and all you have to do is perchase watch and wear it . This is a very neat yet robust watch .It is very clear to read and can be worn for everyday or dressed up .This is a present for my Grandaughter she choose it so that to me sayit all as she needs a strong type watch in her job. This is the third one of these watches that I have had. The first one I had the casing broke the second one finally lost signal to the satellite. They are one of the most accurate watches you can buy with lots and lots of functions. Getting the functions to work can be a little difficult. Still they are a good price and normally last about 3 to 4 years. Was extremely pleased with my purchase a Christmas present for my son in law. It was exactly as described and I do agree the bracelet is on the large side for the average wrist. However, you do need a MAGNIFYING glass to read the instruction manual. Watch is great value for money. Sets time via atomic clock so is never wrong. Strap is easy to adjust to fit by removing links. Silver colour beter looking than black. Blue backlight great when checking time at night or in a movie theater. Good watch for the money and does everything you ask of it. Back illumination is clear as is the watch face its self in normal lighting. Not heavy like others available which is personal preference. Strap is a little fiddly to adjust but can be done with a Multi tool even though there are no instructions on how to do so in the box. If you want a cheap every day watch that you never have to set again then this is for you. Fast delivery service. No problems whatsoever. The watch is easy to set up and one thing I liked was the fact you could set the date in the British format ie ddmmyy & not mmddyy as youre usually stuck with on international watches. Very pleased with the watch to start with, good display of time,date, etc. But now the date, year and day have disappeared and replaced by odd letters and numbers. The instruction book is so small and the print unreadable without the use of a microscope. Also the wrist strap is too large, with no easy adjustment. Also the radio control seems to be non existent Im sorry to say that I am not a very happy bunny. The watch is a replacement for a similar watch that was accidently destroyed. Say it all really. Good reliable watch have had this model for years. have not been disappointed. Ive now been using this watch for 6 months, principally whilst officiating at golf events where I need an accurate time and the ability to be able to monitor 5 minute periods. Its a solid watch and the various functions Time, dual time, chronograph, count-down and alarm have all performed well. It has a clear display and , so far, I havent experienced any problems with the LCD blacking over. The countdown can only be set from 60-1 minute so its no good for boiling a 3½ minute egg! The only problem Ive encountered has been that sometimes Ive accidentally pressed the reset button while the time function is showing. Unless one presses the change function button quickly, the radio controlled search starts and because the watch needs to be in a stationary position while this is happening, Ive lost the time. It resets overnight and you can reset it manually but its just annoying. This is an excellent watch that does what is says on the tin. I need a watch with a common time souce this watch delivers. The product is excellent. It is the second watch of this specification which I have purchased. Wrist strap was too long on delivery despite giving measurements in the order but I have had that rectified. loVE THE SHAPE AND LOOK OF THE WATCH, DISCOVERED MORE FEATURE AFTER BUYING THE WATCH I DIDNT NOTICE UPON PURCHASING. REALLY EASY TO REMOVE AND ADD LINKS TO FIT MY WRIST AND EXCITED TO WEAR IT FOR MY WEDDING IN AUGUST THE COLOUR REALLY MATCHES MY SUIT. COUNTDOWN TIMER AND WORLD CLOCK ARE GREAT IDEAS ASELL AS THE ATOMIC CLOCK IS EXTREMLY ACCURATE. The only thing is the light is not the best and quite dim. overall extremly happy with this watch. Good everyday watch for the money. I did specify my wrist size on purchase, but, I think I over allowed a little too much so it was too loose on the wrist when it arrived. No problem.....just took it to my local Cobblers and 2 mins + £2....done! Purchased to replace the previous model of Casio wave ceptor alarm chronograph. I have two old ones which have a rectangular shape, these are now, after about 5 years, very scratched and I keep them for rough work, gardening and on the allotment. The button which operated the light is now failing on both the old ones. Love the radio time keeping and expect the new one to be just as good. Very pleased with the watch.. It looks very smart and, of course, is an excellent time-keeper.I have had Casio watches, in the past, and have always found them to be very reliable watches. This Wave-ceptor is definitely the one for me. I am very pleased with the service provided by watch shop. Since I already was familiar with Casio, following the instructions was not difficult and as usual the product worked as expected.. I am very pleased with the decision I made. This is the third Casio of this type and design which I have owned. It is stylish without being bulky the essential information is clear and not confused by non essential features. It is comfortable to wear and the metal strap is easy to adjust - just make sure that the spring links do not escape! It has all the features and information I require - so why spend more? The watch is stylish and gives the impression of a well engineered time piece. I was particularly interested in the automatic radio controlled time keeping function. Adjusting the wrist band should only be attempted by the skilled or brave. In one sense the watch is fine because its the third one Ive had of the same model see my previous registration, 20/11/2010. But its also disappointing that the watch didnt last longer Button A became unworkable, so no possiblity of regulating the watch. I really like the watch - just hope it lasts a bit longer than the previous one. I like the rado-controlled timing the clear data the number of options the appearance and, what seems to be a reaosnable price. But how long will it last? Cracking watch, well engineered and very smart looking. For me, I wanted a digital watch with a metal strap that looked stylish, rather than a massive piece of plastic attached to my wrist! This fulfilled all this and more! The bonus was the waveceptor technology that autoupdates the date. Have always wanted one, but now the technology exists to manufacture it in a small package. Really pleased with it. Nice looking watch. Took a little time to workout the ininstructions on how to set wortld time etc. The watch is very lightweight and comfortabel to wear.The face is very clear and easy to read. All in all a good watch for the price. This watch is practical, masculine, and keeps perfect time what more could you want from a mans watch? A very stylish watch and the auto-timing is unique. No need to bother with British Summer Time adjustment which happens automatically. This purchase was for a gift and the he is delighted with it. The dial is clear and easy to read, it fits well and looks stylish. Watch is very good like it very much , specialy radio control so you are not even a single second out from original tome . Very good radio controlled watch. Always accurate time and can be used all over the world with other countries times. Excellent Casio quality. Brilliant service, arrived within tree days of placing order. Couldnt be happier with both service and product. looks great, feels light and its easy to use. what more could you want from a watch that SETS THE RITE TIME ITSELF!!! Very pleased with this watch! Nice clear display, good for those who need glasses. Easy functional use and clear instructions. Looks really smart and good value for the price. I read a lot of reviews which mentioned the plastic strap breaking problem but this has a metal strap and appears well built and solved. Also some mentioned problems with the radio wave reception - be mindful of this and where you live before buying but if the signal isnt a problem then it keeps perfect timing. Once again excellent! Like: radio controlled, simple and easy to navigate. Choose nearest your home city and phones does the dirty work. I like my Casio because I can see everything in one look.plus every thing I look for in watch is there alarm and radio controlled for accuracy.thank you watch shop.you are selling very good watches keep up the good work thanks. 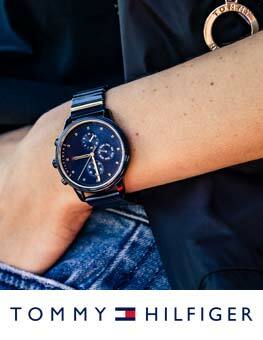 We have been looking for a watch that is both smart and sporty within our budget. All we can say is: finally a smart affordable digital watch. My husband absolutely loves it! Made for a fantastic valentines gift! A very good everyday watch and cheap for what it does. Stylish and very easy to setup and customise. Operators manual is a bit difficult being so small but it has to fit in the box. Suggest you download manual from Casio web site which makes life much easier. Would not hesitate to recommend to others. Very pleased with my new watch. I wanted to replace my digital watch but wanted a metal strap and not plastic, which seems to be the only choice. I have been looking around for a long time for a metal strap AND digital but the choice is limited. The Casio Wave Ceptor has many features that I was looking for in a watch, which my old watch had. It has radio-controlled atomic timekeeping, which means I do not have to set the time, this is especially handy when the clocks go forward or back! It is 50 meters waterproof, it has a light, alarm,hourly chime,stopwatch,world time mode and countdown timer. The instructions were easy to follow. The strap can easily be adjusted by just removing a couple of links. It is a great watch at an excellent price. I would certainly recommend this watch. My watch arrived with the links removed as requested, time date etc all pre set so it was ready to put on my wrist with no fuss atall, it made a change to faffing around prior to use. All paperwork, instructions & docs included, happy days. Will use & recomend WATCHSHOP again. Exceptionally good value for what is provided. The auto time updating is invaluable The silver colour and the strap release is very well designed. Handsome watch, with very useful features - timer, stopwatch, alarm etc. Keeps perfect time of course because its triggered by radio signal. Its everything I need in a watch. Sleek, practical and totally dependable. Guaranteed accuracy provided by self-correcting system means that I am never late for anything. Easy to use and comfortable to wear. I recommend, without hesitation, this watch to anyone that wants consistency and reliability. Well done Casio! I bought this watch to replace an earlier model also of the wave ceptor type. The watch itself is very nice, but the manual leaves much to be desired. Although it explains how to activate the different modes, it does not explain anything about adjusting the bracelet nor about charging or replacing the battery. Is the battery recharged by light or does it have to be replaced? How often? How do you shorten the bracelet which is supplied very long? I could not use my watch for a week until I found instructions on the web. excellent watch with some great features plus its a nice design. service from the watch shop was fantastic. ordered the watch on the Wednesday and received it on the Friday with the bracelet adjusted. emails were sent at every stage of processing my order. will definitely buy from watch shop again and would recommend them without hesitation. Terrific watch. Waterproof, radio-controlled so always accurate and changes with summer/wintr time automatically. Gives world time in a range of capital cities. Whole face is backlit at touch of a button. Easy to use and set up. Displays day, date month year and time with stop watch feature too. For the price this watch is excellent value and it looks cool! Bought this for my teenage son as ot is a bit smarter than his curremt watch. Has all the features he likes and the metal strap looks good. Being radio controlled for tje time it shouldnt need resetting once set up. Strap was easy to adjust and he seems very happy with it. Very fast delivery. Watch workedout of the box with radio signal already detected home counties area. Strap had been adjusted perfectly to my exact wrist size for free,and still fast delivery before date specifiied. Ace product. I needed a watch that had a good Backlight but not expensive. Very easy to alter the Strap size and not difficult as many have said. I like Casio gear and this is no exception. Smooth lines and Atomic accuracy make it a winner for me. I will be getting another for sure to keep as a spare. This gives everything you want from a watch. The time is always exact because its regulated by the Rugby radio which controls Big Ben you dont even need to adjust for summertime - that happens automatically overnight. You have complete date: day, including naming day of the week, month and year. At New Year you coincide exactly with Big Ben, and you can watch the year move on at the first stroke. My first model started to misbehave after about 5 years, losing the radio control intermittently. But that hasnt stopped me buying the same again. Watch strap easy to adjust. The auto time sync is a nice feature. Already had the resin-strap version of this watch - and was entirely chuffed with it. However, when the strap broke after a year, despite gentle and careful treatment, chose to replace it with the steel-strap version in full expectation of it being far more durable. Great watch, great service and fast delivery. Couldnt wish for more!! This is the third watch like this that I have bought. They seem to last about two years and then the plastic case breaks and the strap falls off. I like the watch itself very much and regard the price as rental for two years use. Service and strap adjustment perfect. Occasional problem with watch. Buttons too sensitive and have found it displaying New York time several times. It corrected for end of summer time perfectly. watch is fantastic having 1 hour going back done automatically.As i even keep watch on when showering or going to sleep as it is my 5th casio watch. I first viewed this watch on Sunday 20 October. I was looking for a low cost chrono as a day to day watch. Having had Casio watches before the watch offered everything I was looking for at an extremely competitive price. I placed my order in the late afternoon on Sunday and requested adjustments to the bracelet. As I live in France I anticipated that it would arrive in about 10 days. Unbelievably I received notification of adjustment and despatch on Monday and the watch arrived first post Wednesday morning. I have never received such fantastic service. The watch fitted perfectly and was set and adjusted ready to go. It lives up to expectations and I am extremely pleased with it. I will certainly use your services again and would highly recommend you to friends and colleagues. Great product, fantastic price. This was bought to replace another similar watch. Casio watches are a good buy. This watch I have had before, but with the rubber strap, which kept splitting, so I decided to go for the stainless steel bracelet version as I liked the watch so much. It is light weight, not too bulky, has a clean uncluttered face, with a display of time, date, day and year. The watch is also radio controlled, so keeps time perfectly, it has an alarm function and a timer, and as a bonus it displays world time should you need the facility. What more could you want from a watch. This is a great reasonably priced, every day watch. Nice digital watch which I can wear when swimming. Radio controlled timing which is excellent and all at a very reasonable price. excellent service. sent for on Saturday received on Tuesday. A great watch. Just what I was looking for. although two links had been removed, strap still much to big. Had to pay £7.00 for a local shop to remove two more links. Still too loose. On removing another link, strap too tight to wear. Although I like the watch, I am not wearing it because of the issues above. Undecided as to what to do now, return it or buy another strap. Casio Wave Captor does exactly what it says on the tin. Purchase was super simple and delivery was the next day, which was even better. Could not ask for better service!! I am writing on behalf of the person who the watch was for, he is very pleased with the watch after having an old anolog type, this is more substantial and well built than his old one, he likes the radio control of the settings, that he does not have to correct the time or date also a better strap than the leather one, he also likes the clear read out of time and date at a glance. In all he is very pleased. I have previously had an identical model for several years +5. I had no problems with it apart from following a battery change the radio function stopped working. I was looking for a digital watch and wanted to buy online. I wasnt disappointed and I found a Casio Wave Ceptor with a stainless steel strap which has a large display with all the information you would want - month, day, year - and to make sure you always have the correct time it is radio calibrated by a national time signal transmitted every day at 3am. If you go to another country the time will change in the same way just like when it is GMT or BST here in Britain. I recommend this watch to anyone who is looking for the same thing. Choose 12 or 24 hr and set alarm. Like the bracelet, easy to take out links to suit wrist size. Hourly chime and alarm sound is easily heard as well. All in all recommend the watch to anyone. I was anxious that it would be too clunky but, while not slim and elegant!, its comfortable to wear and its two key for me features of being waterproof and using radio to keep accurate time make it a good purchase. The service I received was excellent and quick. I like the watch because of the ease in which I can glance at it and tell the time even without my spectacles It took me a little while to sort out how to remove a link to make it fit my wrist comfortably but I was aware that this service was available to me from the watch shop when I ordered it. I did encounter a problem registering it and eventually clicked on a slightly different model I think Mine was a 58DU but there was only a 58 DE on the down list. I am pleased with this watch and hope it stands the test of time with regards to reliability and strength. There are probably options on it which at my age I will not use but its a BOYS toy as well as a watch and very handy. Bought this modestly priced watch for my husband to replace the same model he has owned for 5 years. The watch not only looks good but it keeps perfect time and he finds it has all the functions, including world time, usually found on far moreexpensive watches. I will probably purchase the same watch but with the black strap shortly so he can alternate. 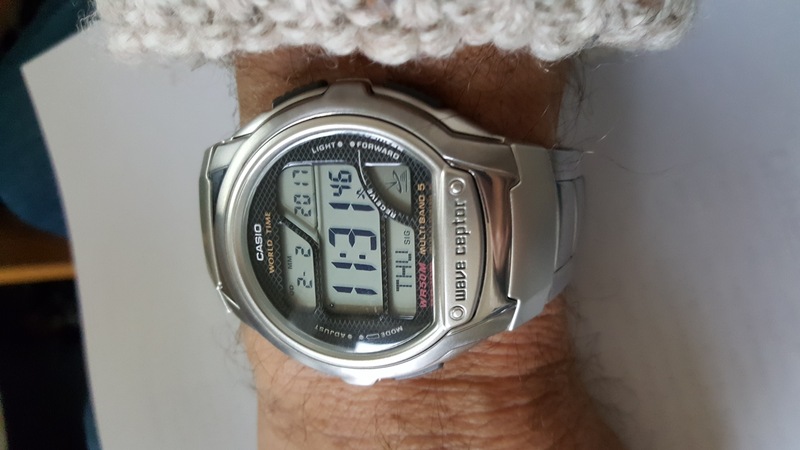 The Casio wave is very comfortable its a great looking keeps excellent time it should as its radio controlled I managed to alter the strap my self with a small set of screwdrivers the face is quite clear but date is quite small Overal a great watch. A very good watch and no more seasonal adjustments! I had a similar model some years ago but that became unreliable kept resetting so hopefully this one will be ok. The watch was clear and easy to set up. It gives precise, simple to understand information in a digital format, on its silver face with black numerals. Can be set to update automatically for summer/winter time changes. The strap had to be adjusted by a jeweller as there are no instructions on how to do it. I have had Casio Watches on previous occasions I like Digital watches with the 24 hour feature. This time I decided on the Radio Controlled model and it is exactly to my style. Bit chubby perhaps but I guess there is a lot to pack in. Found it easy to set up and was amazed by the choices availiable, all easy to access.Great to see it setting itself to local time.Here or various other world wide locations as required by your travels. Not so with the bracelet. I have shortened these before, but each is slighly different. An instruction sheet would help!! As it was good old Google came to the rescue with a very comprehensive How To film. Wanted an accurate, good looking timepiece and got so much more for an excellent price. You cant get more accurate then radio-controlled atomic timekeeping with day light saving and all done automatically. Stylish with expanding brushed stainless steel bracelet that locks securely. Has good size display including: dd-mm-year, day and of course accurate time. It has a stopwatch, count down timer, alarm and hourly time signal if required. A previous reviewer complained that they didnt like the American style display mm-dd-year. If they had looked at the comprehensive User Guide they would have seen how to set up the watch to your personal settings. Standard bracelet circumference is about 210mm or 8 1/4 . 3 links widths are about 1 or 25mm. For function, style & price can you get better? Great looking watch and price. The display is nice and clear and easy to read even, in poor light conditions, and the additional back light feature adds to the clarity. This is my second Casio Wave Ceptor watch and cannot fault the accuracy and reliability. I chose the Stainless strap as I find the plastic can sweat and does not look as nice. If you cannot wait to have the watch, You Tube shows a great video on removing the links. took me about 2 minuets to do mine. Been so impressed with the 58U-1AVES model I use for work I decided to give the silver bracelet 58DU-1AVES model a try for best. It tells the time ,thats what I need a watch for.I only hope that the strap lasts longer than the rubber one on my last waveceptor watch . This Casio watch is all I would want from a watch, It is also very reasonably priced, and actually looks more expensive than it cost. I bought this watch as a second watch to save my more expensive one. But I have actually been wearing it more than my expensive one because it looks so good and it is perfect time because it is radio controlled timing. Great watch, I would recommend. Easy to programme. Excellent facilities. Looks good. I had a similar casio 10 years ago. This one matches it. Would recommend highly. The watch was well priced. Received the item in Germany!! Royal Mail and GLS one week after I ordered it. So it was quick delivery. Have recommended this site to friends for great deals on great watches. I am very happy with the purchase and I would buy again. Well done, watchshop!! Easy to set up and excellent value for money. I fully recommend this watch to anyone. The watch was exactly as described and expected. The strap had been adjusted to my required size. I needed to find a radio controlled watch as I work to a timetable. As I do not like plastic straps this watch with metal strap suited my requirements and was a good price. I bought this watch for my husband. He likes the elegant look of bracelet, which has a nice, matt-like shine. The watch itself is large enough, and display is conveniently adjustable first thing we did was replacing the American style data into European one, so day first, then month, not the opposite. It is light, comfortable to carry, and the shop will adjust the bracelet for you, which is great. The watch features amazing wave ceptor function, which automatically corrects the time according to atomic clocks. That means always correct time and no more bothering with manual switching to summer or winter times! Indeed great device, we love it, and couldnt recommend it more! My watch is silver in colour and has all of the features and usability that I want in a digital watch. I am very happy with the purchase. I have just received this fabulous Casio watch after many,many days of looking at numerous watches....after all....you only buy a watch infrequently so buying the right one for your needs is vital. This watch delivers all the above in spades and has many extras as well such as letting you know the time in numerous cities around the world and a stopwatch facility. Previous reviews have stated the manual as being a downfall but I found it extremely easy to follow as it was laid out extremely well....ok the print is a bit small but the manual has to fit into the presentation box after all. The watch was also preset on arrival which meant it could be placed straight onto my wrist...it also fits like a glove after having been made to my exact wrist measurement by the kind people at watchshop who removed the exact amount of links to the wrist measurement I had given them I urge you to do this to save time and expense . The lightweight,attractive metal strap has an ingenious safety clasp feature that ensures the watch stays secure on the wrist. The watch body itself is a clever mix of metal and plastic which keeps the weight to an absolute minimum without looking cheap. As a watch geek this has to be the best watch I have ever owned and I cant praise it enough...a big well done to Casio who have designed a watch to rival many far more expensive models. Regards any negatives I honestly cant find any.....youll not be disappointed with your purchase. My husband was extremely pleased with the watch, this is the third one he has had over the last few years and will only buy Casio watches. The watch was well priced and the despatch was immediate. received the item day after I ordered it, couldnt ask for more. however, I did request the length of chain to be shortened and this was not done. I got it altered locally and the Watchshop have promised refund of costs. will wait and see! the watch itself is very nice and functional. As they say, this watch is exactly what it says on the tin. Spot on accurate timing and I can do the washing-up without worrying to take it off. 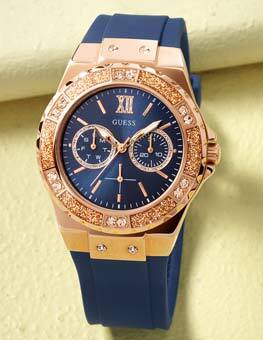 Stylish watch with latest technology at a very competetive price. Features digital world time, light, metal bracelet. Modern easy read dial. Love it, smart multi functional and classy, all I need from a watch. Order was delivered promptly and will recommend Watch Shop in future. Nice looking watch, comfortable to wear, bracelet fits well, looks a quality watch, once you set the time signal to receive thats all you have to do, then youve got the correct time and date all the time, even when the clocks go forward and back, it does it itself. An excellent fine looking watch with loads of features.Easy to see the information on the dial and being radio controlled theres no need to worry if the time shown is accurate. Pleased with product but information on stainless steel strap shortening would be helpful. I think this was one of the best bargains I have had, One well known jewelers quoted me £120 as the cheapest Casio Wave Ceptor they had As I said a very good bargain. An excellent product that met all my requirements. Clear face, world time, accurate timekeeping, not too bulky, easy to adjust. Great watch sets itself right every night by radio control even when it is on my wrist in bed ! Strap was too big but it was easy to take some links out , look on U Tube for a video on how to do this . This is the second Wave Ceptor Ive had - only replaced the last one as I managed to break the glass by running over the watch! This new one is pretty good - comfortable fit and easily adjusted bracelet. The display is easy to read and the alarm/timer/stopwatch are equally clear when in use. There may be some bad points but Ive not found them yet! To sum up - a good watch at a reasonable price. Look on line for how to shorten the strap. There is nothing in the instructions but there are some Utube videos that make it simple. Its a pity that the watch body is plastic and not metal so it will not be long before it gets damaged. Very pleased with watch very comfortable to wear good to look at. I keep needing to check I have it on ! Very easy to set up, good instructions hardly needed and spot on accuracy. Downside it has a battery not user changeable but said to last for 2 years with average use, So its a while before I find out the cost of sending of for battery replacement to say nothing of being without the watch for a couple of days. Maybe I can get it done on the high street. I had the same type of watch for a long time but the strap broke so i thought that i would get another because I am very pleased with it. The new one is the same as the last except it has a stainles steel strape. I believe that it is a great watch. Very reliable timepiece, spoiled by the inferior resin case. My previous (identical) watch failed at the point where the strap pin attaches to the case. Casio offer no repair for this inadequacy. However, Im prepare to try again. The braclet is not the most ideal design on a smallish size wrist due to the size of the links and clip, therefore is not a perfect wrist shape fit. Links have to be removed professionaly, its not an easy job. Excellent product. My husband had one of these before so knew it was a very good watch in every respect. Я легко перевел их на русский язык,поменял формат даты,укоротил браслет-все отлично,жаль только,что,что стекло не сапфир ! Replaced my older Casio model which died after many years of good service. Found it hard to find an economical digital face anywhere except here. Almost exactly the same features but more attractive layout. The display on this watch is clear and concise. The date, however, is shown backwards in the illogical American style with the month first and the date second which I find somewhat irritating. Why the manufacturers cannot consider the preferences of users in other countries is a mystery. Surely it is easier to say, for example, the tenth day of the third month rather than the other way about. The watch itself is rather chunky but is OK. once you get used to it. There is nothing in the user instructions as to how to adjust the strap which is accomplished by the removal of some of the links. These are very difficult to remove and the service of a watch repairer will probably be required. Ordered mens Casio Wave Ceptor Alarm Chronograph Watch WV-58DU-1AVEF. This product does exactly what it is intended to do - provide an accurate time check, while offering facilities such as alarm and countdown. And having a silver metal bracelet means it will not wear out as quickly as those offered with a resin strap. One downside is the instruction booklet. It is very small and difficult to handle while the user is setting the features. Stylish and practical. It is functional with a clear display for the time but the date is much smaller. Only 1 alarm. I got this watch for myself after my last one stopped working. This one is very comfortable to wear. It came already set up but reading the instruction booklet it would be very simple to do. I also like that the time is always correct, being radio controlled. If you want a smart easy to use and very comfortable watch then I highly recommend this one. I bought this watch for my dad for Christmas. My main reason to buy particularly this one was that he can wear it with casual and smart clothes as well. Excellent value, he loves it! We were very pleased with the watch, which is a stainless steel bracelet watch, with automatic time setting. Great service. The watch is exactly as illustrated and described. The price was very competitive compared with similar watches elsewhere. From ordering to delivery took less than 24 hours, even though the bracelet needed alteration before despatch, to fit my wrist.Finally, I received several emails describing the progress of my watch. very good value .Exellent features. I like the radio control feature and the display,also having back light. Did not like the use of plastic on watch body, I would prefer all stainless steel and would pay extra for this. The most unbeatable of watches for the money. It does everything and more. World time zones, alarms, stopwatch, countdown timer and night light. Very easy to use and extremely accurate (to about 1 second a day) with adjustments made through the night to bring it back to full sync with radio controlled signal - so basically, it's never more than one second out. Very robust and durable with a clear display and curved function buttons which are just the right size. I took this watch on holiday across Europe and did not worry about banging it, ping it or getting it wet. It looked great with a tee shirt as well as when I was more smartly dressed. I do have more expensive watches but this did the job for my holiday and as mentioned above, an absolutely fabulous watch for the money. excellent watch for the money. 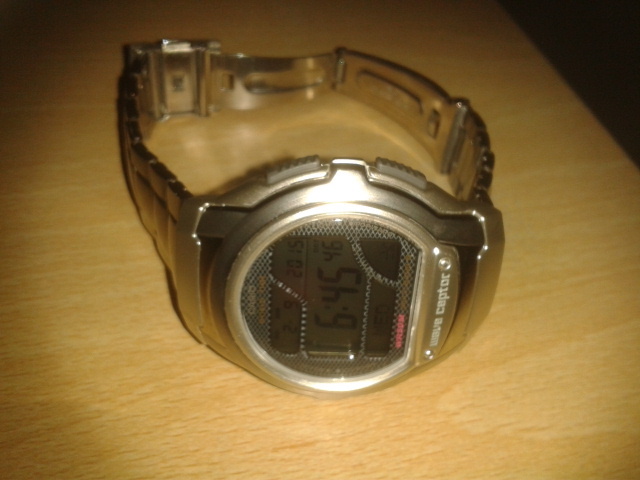 This is my second Casio from watch shop and for value for money they cannot be beaten. Excellent service from watch shop. Looking for my Third Casio for evening wear. This store best price I've seen. I bought the watch as a gift, and they are much prettier than the picture! Respect vatchshop! The watch is really nice looking. It feels and looks like a 200 pounds watch. Setting up the time was easy, it took a few seconds. It got synchronized with the satelite. I check the time on my computer and it is synchronized to the second, which is great. I would recommend his watch. A bad point is that it is really hard to adjust it to your wrist. Even if the people at WatchShop removed a few links as I requested, my calculations were wrong, and I had to take it to a watch shop to have it adjusted again. Great product, stylish and excellent value for money. Just been to Spain the chage of time zone was easy. Would recommend to antone considering buying this watch. My boyfriend wanted a smart watch but with that retro feel, and one showing the time and date without having to press buttons. This fitted the bill perfectly and he's chuffed to bits with it. The watch does everything I wanted and shows the time, full date and day of the week all without any button pushes. The time remains completely accurate courtesy of the radio connection to an atomic clock. 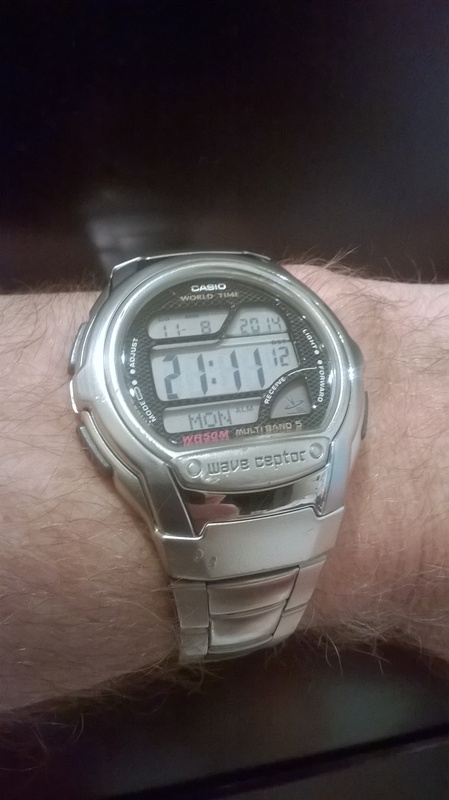 I have had previous Casio watches and this one lives up to expectations. Product excellent providing excellent,useful features at an unbeatable price. Only downside was the extemely difficult task of adjusting the bracelet which required super strength and dexterity. The only issue I found is the watch strap which is very hard to adjust yourself. Take my advice, SEND IN YOUR WRIST MEASUREMENT WHEN YOU ORDER ONLINE and the nice people at the watch shop will take out the extra links and save you the hassle and expense of taking it to a jewellers to take out some links. This saving, and the fact that postage is free, would mean that it works out at about the same price as amazon, (which do not offer the strap adjustment service). The strap was too big and there were no instructions for taking links out. This is a really neat watch. The wave ceptor works really well for me (It doesn't need to be beside a window or anything for it to work) it's actually really useful to have a really acurate watch. The display's nicely set out, I like the light, useful to have the time in the corner when in other modes, as with all watches, I use the alarm all the time. The metal strap is confortable, It's great to have the right number of links taken out for you. All in all, great watch. I wanted a digital watch with a stainless steel bracelet for every day use, that also gave me the day and date, and this was the best I could find. The watch is designed to set itself to the right time from a broadcast signal which is great for travelling but not all areas are covered. However, you are supposed to set it manually at first but I didn't need to - it sorted itself out. A nice clear watch face which is easy to read with a comfortable bracelet that fastens with a decisive click. The alarm signal is too quiet. The biggest problem was the need to shorten the bracelet as no instructions were given. It doesn't use the usual pins. The good old internet helped, although I couldn't find the exact design, I got enough information to figure out what to do. 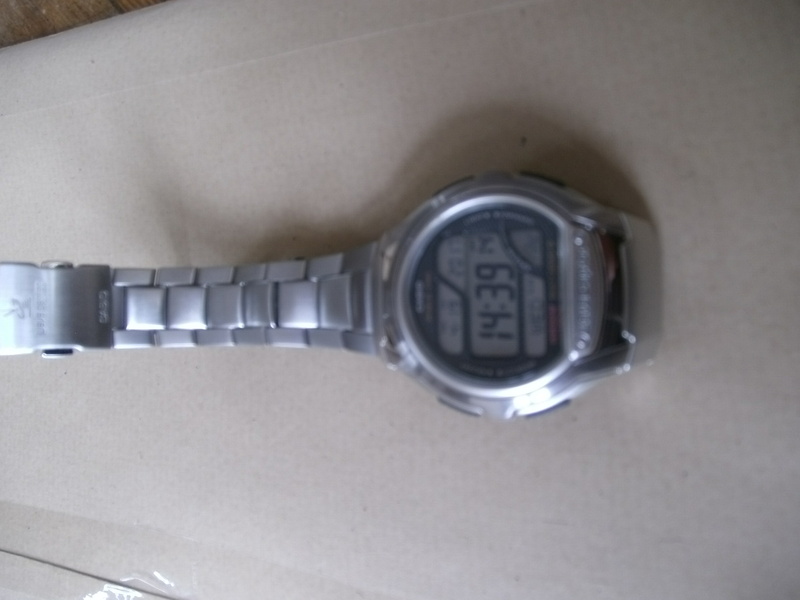 Overall a very good, value for money, digital watch. Just received a new replacement watch as my previous one went haywire after 13 months of faultless use.info displayed reverted to 01/01/2005 & not able to reset.Was very happy with watch up to that point.Very pleased with features of watch but not impressed with Casio response on trying to get info on adjusting wrist band.Had to look on net to get it. A good looking and accurate watch. I can even read the date without needing to put reading glasses on! It would have been nice if instructions ad been included on how to adjust the watch strap to fit me. It seems silly to have to take a new watch to a watch supplier to get it adjusted. Service and product exactly as described. Communications excellent. You can Shop with confidence. but find it very difficult to set automatic receive for the time. This watch is great. Easy to adjust and very clear display. This is the 2nd that I have had the 1st with rubber stap failed after 1 year so I would avoid this model. The steel cost £4.00 more and offers great value. now ive worn it for a week the case has already scratch, the metal coating is wearing away, it plastic underneath, and the botom half of the case is also plastic and not cover in metal. cheaper watches ive had are all metal. what your paying for is the electronic features, not the casing. The problem with Casio is that its product is so well constructed that it keeps working on and on. 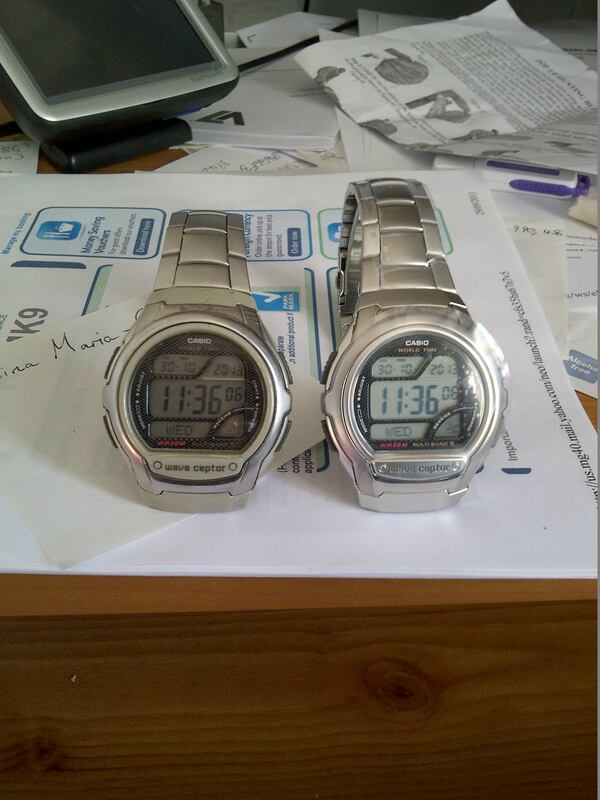 2 previous Casio watches had to be given away in working condition because I wanted a new one. Each lasted me more than 10 years. I hope this watch outlasts me. Many people need to have the time of 2 places at the same time, like London and New Delhi. Radio is the future. The watch was exactly what I was looking for as a present for my husband who was thrilled with it, he thinks it was so much more expensive than it actually was!! I actually bought it for the Wave Ceptor function and didn't realise what a good looking watch it it in the 'flesh'! Nice clear face, and it is easy to see which is the month, and the day. On some watches the put day then date, on others the reverse. I bought this watch because of its good price and the wave ceptor technology.dont have to worry about the correct time because it updates itself everynight so i can be sure of the correct time.it also includes features like world time, stop watch and countdown timer so pretty good use of these functions.Personally,i am pretty satisfied with this watch and most importantly the price offered by the watch shop. Don't buy it unless you want grief using the timer. In timer mode, the watch will sometimes revert to factory default settings if you press a certain key (D, the one that's at 4 o'clock). It doesn't always happen, and that's why I won't be sending mine back, because they'll just say they can't replicate the error. Anyway, I've had to have links taken out now, because the braclet is for a weightlifter's biceps, not my wrist, so they probably wouldn't take it back, anyway. This resetting is annoying, because you then have to set it to look for the signal from the Rugby atomic clock, wait three minutes for it to set, and then make any customising adjustments you require, such as D/M rather than M/D. This seems to happen only in timer mode. As I say, it doesn't always occur, but it's doing it often enough to cause problems. I don't know whether this is a known fault. If it is, and Casio or the Watch Shop wishes to email me, fine (I've had to include my email address with this, so they can pick it up). I'll think twice before buying Casio products in future.